What are numbers in Math ? A number is a mathematical tool which is used in counting individual quantities, calculating and quantifying. In general, decimal number system is used which consists of 10 digits, from 0 to 9. What are various operations that can be performed on numbers? • Addition: It is the process of finding out single number or fraction equal to two or more quantities taken together. • Subtraction: It is the process of finding out the quantity left when a smaller quantity (number/ fraction) is reduced from a larger one. • Multiplication: It signifies repeated addition. If a number has to be repeatedly added then that number is multiplicand. The number of multiplicands considered for addition is multiplier. The sum of the repetition is the product. • Division: It is a reversal of multiplication. In this we find how often a given number called divisor is contained in another given number called dividend. The number expressing this is called the quotient and the excess of the dividend over the product of the divisor and quotient is called remainder. Now lets discuss how Classification of Numbers is done. What are different types of numbers in mathematics? • Real numbers: Numbers which can be quantified and represented by a unique point on the number line are called real numbers. • Complex numbers: Complex numbers are the numbers which have both real and imaginary part. 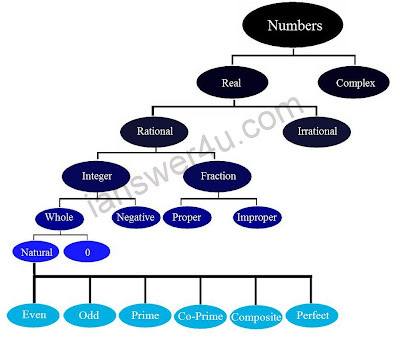 • Rational numbers: Numbers of the form p/q, where p and q are integers and q≠0 are called rational numbers. • Irrational numbers: Numbers which are not rational but can be represented on the number line are called irrational numbers. • Integers: Rational numbers of the form p/q, where p and q are integers and q= ±1 are called integers. • Fractions : Fractions are a type of rational numbers, which are of the form p/q, where p and q are integers and q≠0 and whose numerator is less than the denominator and both are in the lowest terms. • Whole numbers: Whole numbers are the set of positive integers from 0. They do not have any decimal or fractional part. • Negative integers: Negative integers are the set of negative numbers before 0. They do not have any fractional or decimal part. • Natural numbers: Natural numbers are the set of positive integers, that is, integers from 1 to ∞, excluding fractional n decimal part. They are whole numbers excluding zero. • Even numbers: Numbers divisible by 2 are called even numbers. • Odd numbers: Numbers which are not divisible by 2 are called odd numbers. Odd numbers leave 1 as the remainder when divided by 2. • Prime numbers: Any number other than 1 which does not have any factor apart from one and the number itself is called a prime number. 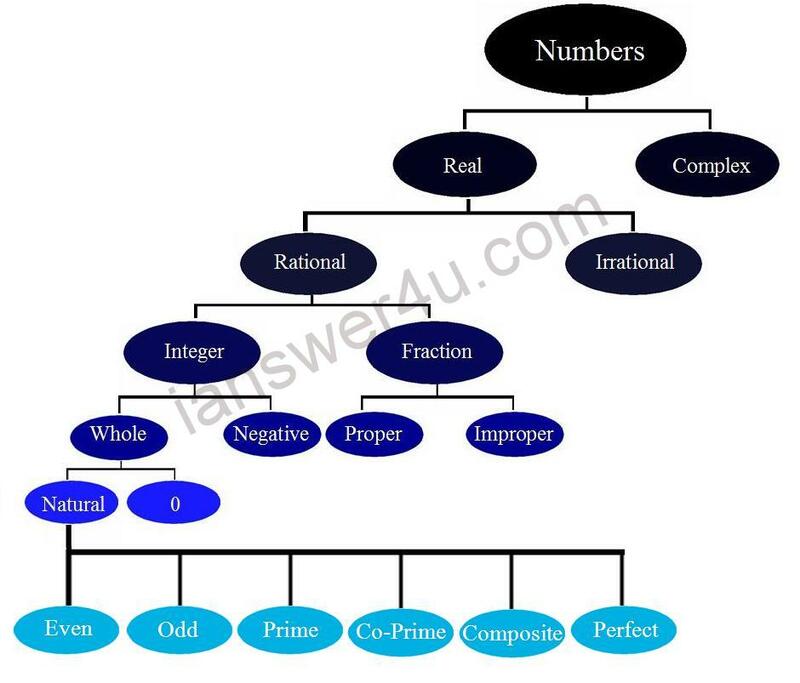 • Co-prime/relatively prime numbers: Two numbers are said to be co-prime or relatively prime if they do not have any common factor other than one. • Composite numbers: a number that has more than two distinct factors is called a composite number. • Perfect numbers: A number is said to be a perfect number if the sum of all its factors, excluding itself (but including 1) is equal to the number itself.